1-2 Patagospyris ? sp. ; 1, dorsal view, VS-R-81a, 1-3cm, G44/0, 300x; 2, dorsal view, VS-R-133a, 1-3cm, M46/0, 300x. 3-5 Rhodospyris sp. 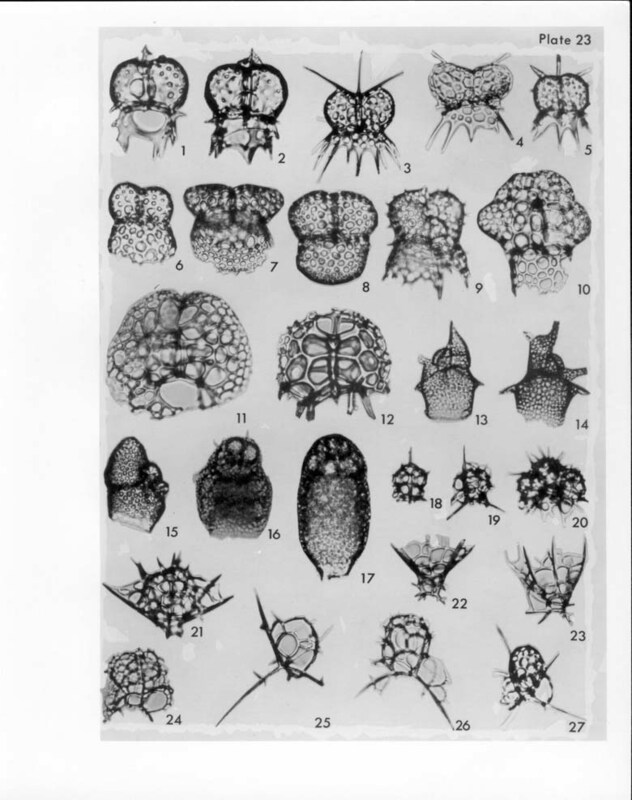 ; ventral view, VS-R-81a,, 1-3cm, Q39/4, 300x; 4, ventral view, VS-R-27b, 1-3cm, D44/2, 300x; 5, ventral view, VS-R-92b, 1-3cm, F31/3, 300x. 6-8 Desmospyris anthocyrtoides (Bütschli) Haeckel; 6, ventral view, VS-R-106b, 1-3cm, E14/0, 300x; 7, oblique basal-ventral view, VS-R-71a, 1-3cm, V28/1, 300x; 8, ventral (?) view of specimen with basal mouth closed, VS-R-106b, 1-3cm, O14/3, 300x. 9 Phormospyris tricostata Haeckel; dorso-lateral view showing the small dorsal lobe at the base of the cephalis, VS-R-106b, 1-3cm,W51/0, 300x. 10-12 Tricolospyris kantiana Haeckel; 10, ventral view, VS-R-92a, 1-3cm, D19/0, 300x; 11, ventral view, VS-R-60b, 3-5cm, X36/1, 300x; 12, ventral view, VS-R-106a, 1-3cm, M25/0, 300x. 13-14 Acrobotrys cf. disolenia Haeckel; 13, left lateral view, VS-R-93b, 1-3cm, C46/2, 300x; 14, right lateral view, apical and dorsal tubes lying in the sagittal plane, VS-R-81a, 1-3cm, F29/4, 300x. 15 Acrobotrissa cribosa Popofsky; right lateral view, VS-R-60a, 3-5cm, N39/4, 300x. 16 Botryopyle sp. ; left lateral view, VS-R-60a, 3-5cm, R15/4, 300x. 17 Botryocyrtis cf. caput-serpentis Ehrenberg; VS-R-27b, 1-3cm, S51/0, 300x. 18-20 Plectacantha oikiskos Jörgensen; 18, dorsal view, VS-R-191a, 1-3cm, C18/1, 300x; 19, right lateral view, VS-R-191a, 1-3cm, G19/4, 300x; 20, right lateral view of cephalis surrounded by secondary lattice, VS-R-133b, 1-3cm, L41/0, 300x. 24-26 Phormacantha hystrix Jörgensen; 24, (?) oblique basal view from left latero-ventral side, latticed cephalis well developed, VS-R-106a, 1-3cm, Q30/2, 300x; 25, right lateral view, VS-R-60b, 3-5cm, X31/3, 300x; 26, left lateral view, VS-R-81a, 1-3cm, H53/3, 300x. 27 Peridium longispinum Jörgensen; right lateral view, VS-R-60b, 3-5cm, T30/0, 350x.